Get latest Shingeki no Kyojin 46 Spoilers (進撃の巨人 46 ) or Shingeki no Kyojin 46 / attack on titan 46 Discussion at mangaspoiler.com. if you would like to discuss the Spoiler or prediction, please leave a comment below. Eren: How did you feel when I told you that? This world has no future? What does he mean by “monkey”? Thing is Eren, if you think it’s over because we beat those two, you’re completely wrong. *Note this doesn’t mean Ymir is the Enemy, Reiner or Berthold merely interrupted her. Reiner is under the delusion Christa likes him cause she’s so nice to him which pisses off Ymir. Eren wakes up. He’s surprised that his arms aren’t regenerating at all. Same for Ymir. Looks like Reiner did it. Eren chews on his arms to try to turn back into a titan, but Ymir stops him by telling him that they’re surrounded by titans. Ymir asks what Reiner and Berthold intend to do with them, and they reply that they want to go back to their hometown to repeat their conversation (?). Eren wonders how they can escape and what happened to the Scouting Legion. 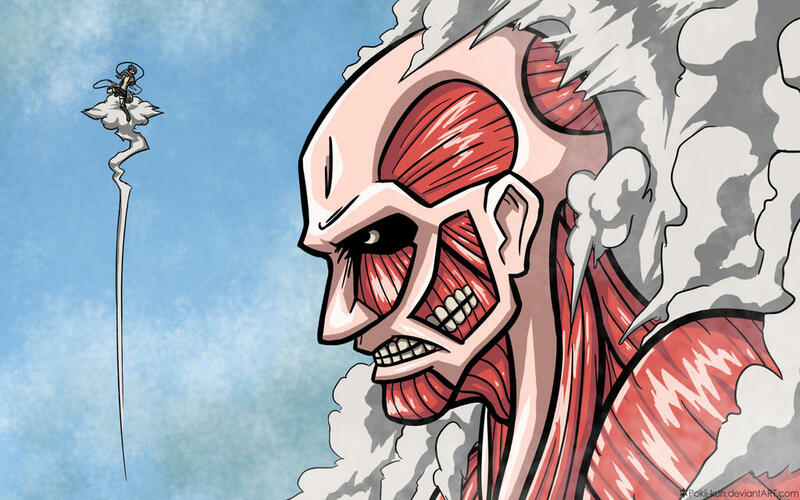 Eren wonders why Ymir can become a titan. For now, he decides to get some information from the other three. But as Eren wonders what and how to do this, Ymir asks Reiner for water. Reiner rejects her, citing the circumstances. [Eren?] realises that he hasn’t eaten or drank anything since yesterday morning. “Well, in the end the wall wasn’t broken, so let me take a break. The talk of [raising of status?] can come later,” he says jokingly. Ymir tells Eren that there’s nothing normal about [him? ], and that if he knows something he shouldn’t stay quiet, he should do something. Ymir admonishes Reiner with “you’re not a soldier, are you? We are.” Reiner replies with “yeah, you’re right” and covers his face with one hand. Ymir comments on Reiner’s confusion. “I thought it was strange. To risk your life breaking the wall, then saving Connie. You were unaware of this contradiction. You probably wanted to be the soldier whose goal was to break the wall, but while playing the role of a soldier, you forgot what your goal really was. As a result, your heart broke, you altered your memories, and your speech no longer meshed [? ].” Reiner looks at Ymir in amazement. Naturally, there’s no way Eren understood that explanation. “I thought it was unfortunate,” says Berthold, as though he was someone else. Ymir explains how Monkey Titan is the reason the Titans are spawning within the walls. She says he is doing this for reconnaissance to judge how strong the humans are. Ymir tells Eren that Bert and Reiner want to head to where the Monkey Titan is because that will lead them back to their homeland. Ymir refuses to explain further. But says defeating those two titans doesn’t mean anything. Eren asks who the real enemy is. Ymir about to tell but Reiner stops her. Reiner – Do you think this world has a future? Reiner – If you know that much then think about your position. You could help us, come to our side. Ymir – Trust you? Impossible. You can’t and don’t trust me. Reiner – No, we can trust you. Your purpose is to protect Christa. There is a panel of an angel looking back. Ymir changes her expression. Reiner – I know we can agree on that. You may think I’m joking, but I want to protect Christa as much as you do. Or do you put more trust in Eren? Eren and Ymir look at each other. A streak of sweat over Ymir’s forehead. Reiner – You wanted to use Eren to escape out of here. You thought if you were taken by us, there was no chance of you surviving. Even if you are with us, I can’t guarantee your safety. But if it’s only Christa, we might be able to save her. Either Christa’s safety or the short life you have left. You have to choose. A confused Eren asks once again, who is the enemy?! Shingeki no Kyojin Trivia: Hajime Isayama stated in a interview that he based Eren’s titan form off of the Japanese martial artist Yūshin Okami, paraphrasing it to be the “ideal physique of a middleweight mixed martial artist. When is the next chapter out? 3 weeks (?) something like that. @ADMIN GIVE US A NEW PAGE PLZ!!!!!! they mean to say thread right?